Irene O'Garden and John Pielmeier amongst the trees of "Windway." Whenever I see old trees, I think, Where are the little ones? You've got to have little ones." Irene O'Garden leads me through an alley of giant catalpas at the northern edge of Windway, the 15-acre property she shares with her husband, author John Pielmeier. O'Garden is the author of children's books, plays, and poetry (her latest collection, Fulcrum, is out this fall), as well as an artist and actress. Pielmeier is a playwright ("Agnes of God" and the stage adaptation of The Exorcist) and the author of the forthcoming novel Hook's Tale—a fictional memoir of Peter Pan's Captain Hook. 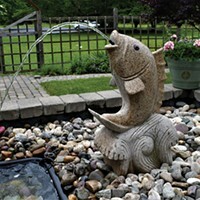 Stewardship of land—planting of lindens and locusts, cherry trees and maples; the care of gardens; the preservation of wild spaces not just for the creatures that live there but for future life—is a charge O'Garden and Pielmeier have embraced since moving to the Hudson Valley 30 years ago. Both grew up appreciating the power and magic wild spaces offer. "I always felt a little like I was growing up on an island," says Pielmeier describing his hometown of Altoona, Pennsylvania. Ten minutes from his house were the Allegheny Mountains, where his family spent most weekends hiking and enjoying the outdoors. 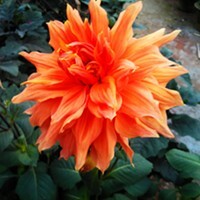 O'Garden also realized the value of nature early. Growing up in Minneapolis with seven siblings, it was her escape. "Across the street from our house was this lovely wild place, the Minnehaha Creek. It was wonderful to go and have some solitude and quiet," she recalls. Designed by architect William A. Boring, who also designed the Ellis Island Immigrant Station, the 4,500-square-foot home sits on 15 acres of fields and woods gently sloping toward the Hudson. In 1984, after living in Manhattan for seven years, their biophilia compelled them north, and they bought a small farmhouse in Cold Spring. "When we moved up here, there was no period of adjustment," Pielmeier tells me. "On our first night we felt like we were home." When 27 acres of land across their road went on the market, they purchased that parcel as well. They lived in the Cold Spring house for 12 years. "It was a beloved first house and a wonderful retreat," O'Garden recalls, but as writers working from home they eventually needed something bigger. Selling the house, however, meant also selling the 27 acres—a patch of wild woods they had grown to love and couldn't stand to see divided and developed. "It felt like taking a pet to the slaughterhouse," O'Garden remembers. That's when Pielmeier and O'Garden approached the Hudson Highlands Land Trust, offering to donate the 27 acres. At first, the HHLT, formed in 1989, didn't quite know what to do with the land. They briefly considered developing the land themselves so they could be in control of the amount and way it was developed. However, board member Lars Kulleseid had a better idea. Surrounding the 27-acre donation were more woods—also slated for development, but mostly still standing. Kulleseid, along with Executive Director Susan Bates, convinced four adjacent neighbors to purchase an additional 45 acres and donate it back to the land trust. Their efforts grew that initial 27-acre donation into a 72-acre forest preserve. The Clove Creek Project is the largest preserve established by the HHLT and laid the groundwork for future conservation efforts in the Highlands. In 1996, the couple bought Windway, their Georgian style home in Garrison. Built by the artist Kenneth Fraiser in 1906 and named for the strong breezes that blow down the valley, the house had seen better days. (The sitting room had even been used to stable a horse.) "It's funny," O'Garden says, "when you're looking at a house, and it's not right, you think—Well, I'd need to move that wall or change that room, I can't do that. But when you've found the right house you think—Well, we can just move that wall and change that room. We loved it in spite of its being a wreck." 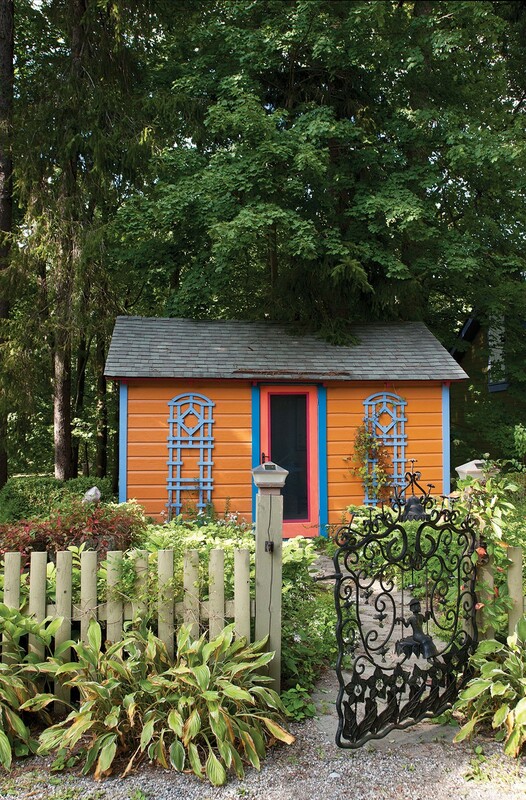 O'Garden's writing cottage nestled among trees on the property. 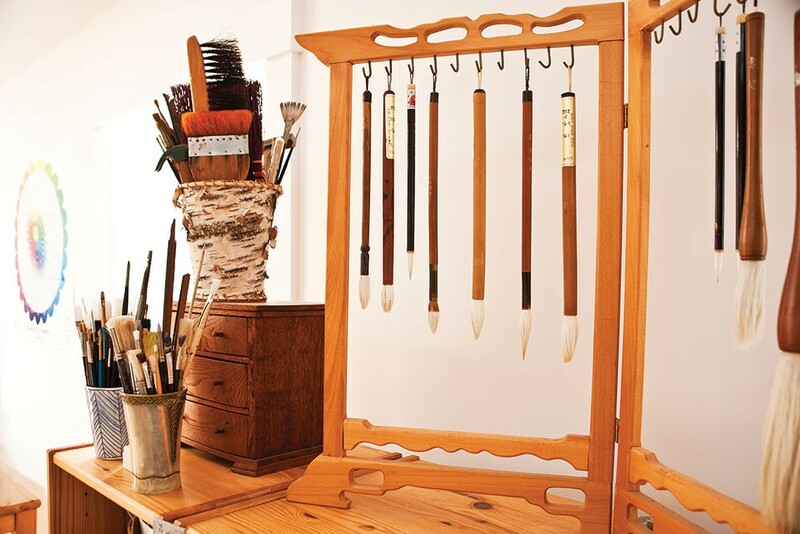 The house—now full of colorful, whimsical details that reflect the fertile imaginations of its owners—has been the couple's main hobby for the past 20 years. At the entrance, a wall and a phone booth were removed and coffered ceilings and a skylit foyer were added to create the home's main hallway. They hired the artist Thomas Donahue to paint murals throughout the house—including a floral motif along the entrance's wainscoted walls and a forested guest bathroom upstairs. Donahue also created a tile mosaic reminiscent of the property's bucolic landscape at the home's threshold. Pielmeier's downstairs office is decorated with memorabilia from his many plays and films, as well as homages to his two great influences: Robert Louis Stevenson and J. M. Barrie. A working fireplace is decorated with tiles depicting characters from Peter Pan; above is a framed letter from Stevenson. A downstairs closet with plenty of shelving and a lovely view was ingeniously combined with a small bathroom, to create a unique library/bath. 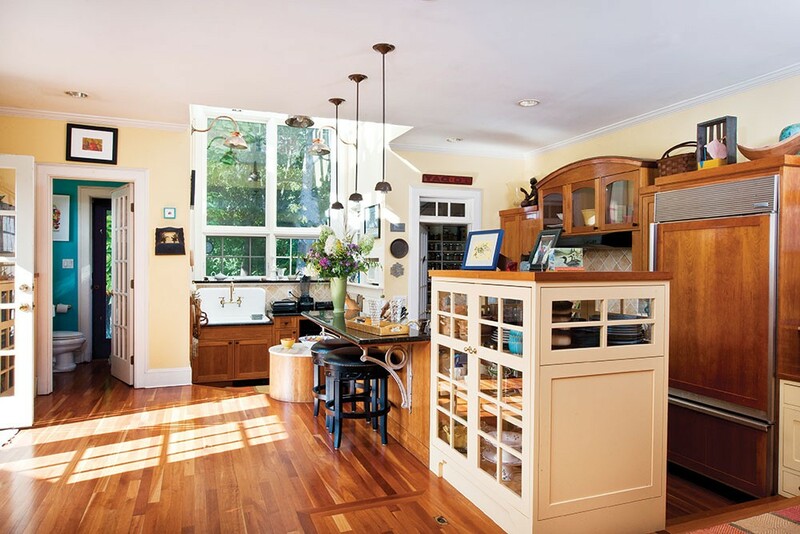 The couple converted Frasier's original north facing painting studio into a large kitchen, adding an arch of windows and skylights over the kitchen sink. The back wing of the house—a succession of open, airy kitchen and dining and sitting rooms with high ceilings and french doors—offers sumptuous western views. Spraypainted white by the previous owners, the sitting and dining rooms required careful restoration but yielded literal treasure. "When I first saw the rooms," O'Garden says, "I had an image of myself up on a ladder, taking off the white paint." When she and Donahue began their scraping, they uncovered gold leaf trim. A wall in the home's entranceway. The artist Thomas Donahue hand painted murals throughout the house. Upstairs, the second floor has three bedrooms and additional office space. 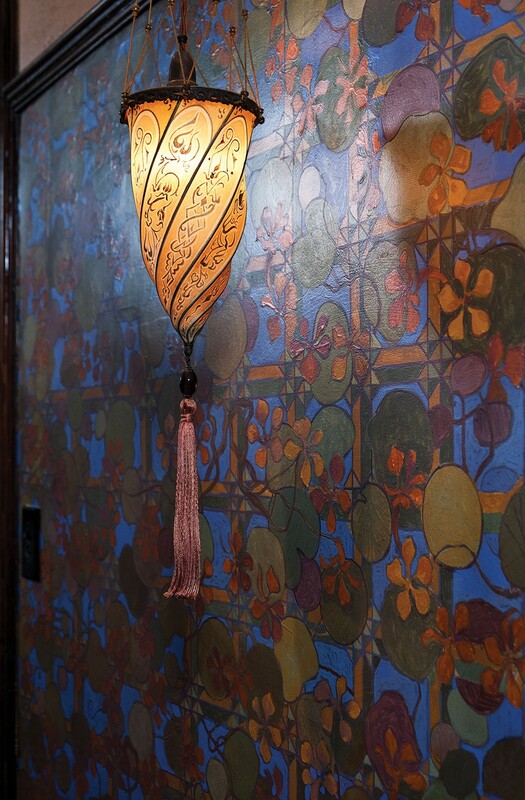 (Donahue carefully pulled cowboy-themed wallpaper from one bedroom and uncovered a handpainted peacock mural.) The master bedroom suite includes a working fireplace (stenciled with one of O'Garden's poems), a bathroom with a large soaking tub, and French doors leading to a balcony. By knocking down walls and adding skylights, the couple created a large studio from the third floor attic. Their latest innovation—a hatch in the middle of the attic ceiling—leads to a small balcony at the apex of the home's roof. 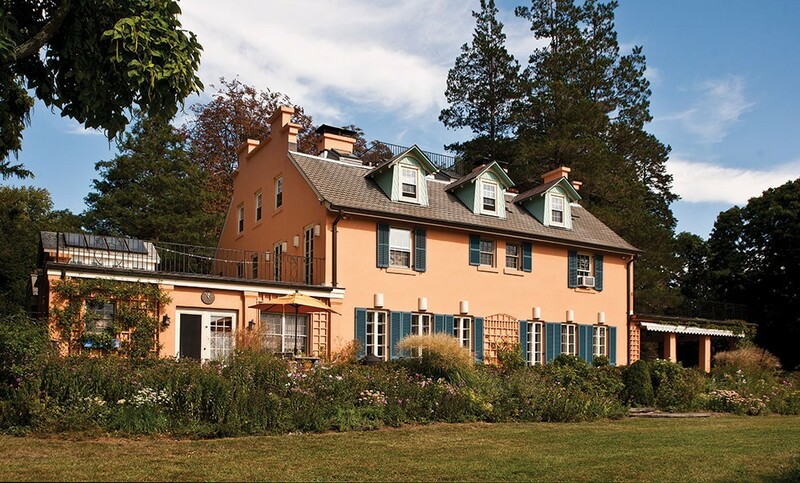 Here, there are spectacular views of West Point and the Hudson Highlands across the river, as well as a bird's-eye view of the intricate patchwork of woods and gardens that has grown around them. Five years ago, Pielmeier and O'Garden approached the HHLT again, this time to protect Windway with a land conservation easement. It's another way to share their land, even after they've gone. That impulse—to plant seeds, protect them, and watch them grow—also inspires O'Garden's work as a poetry educator. "It continues to surprise me that nature isn't a part of every kid's life," she says. The "River of Words" program, started by the poet Robert Haas and administered locally through the HHLT, aims to rectify this problem by connecting children to their local watershed through poetry and art. Through it, O'Garden goes into local schools, leads students on nature walks, and mentors them to write about their experience. The program cumulates with the "Poetry Trail"—an event where participant's poems are hung, gallery style, throughout nature preserves along the Hudson. O'Garden has a studio space in the attic for art projects. She began her career as an actress and then evolved into a writer and artist. One of her latest passions is calligraphy. All of her work focuses on "anything that amplifies the power of words," she says. Back downstairs, in a corner of the second floor, is a small collection landscape paintings by the original owner, Kenneth Fraiser. O'Garden and Pielmeier discovered the canvases rolled up in an outbuilding and had them professionally restored. The paintings provide a visual record of Windway, showing how, over the past 110 years, the fields of the former asparagus farm have transformed back into woods. They are poetic evidence to the fact that a few people, with some creativity, can protect and reclaim what's wild for the generations to come.